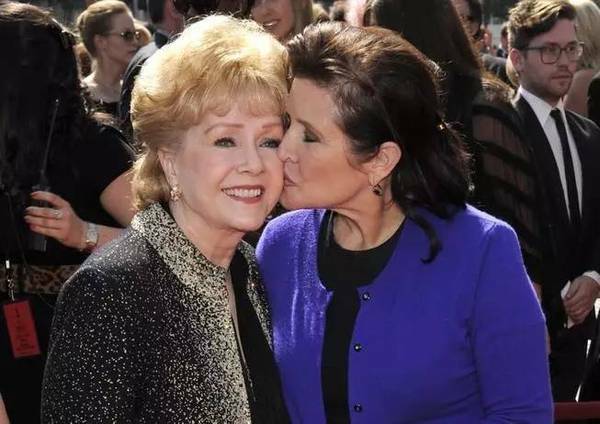 Debbie Reynolds' son, Todd Fisher, said his mother told him that the death of her daughter, Carrie Fisher, was "too much" for her. On Wednesday, one day after Fisher's death, Reynolds, 84, died. "I want to be with Carrie," is what she said just before her death, Todd Fisher told the Associated Press. Can people die because they are so upset over the loss of a loved one? Some call it "broken heart syndrome." The American Heart Association lists a "broken heart" as a medical condition. It reports that it can lead to sudden intense chest pain, especially for women. The good news, it said, is most people make a full recovery. Debbie Reynolds was a movie star, beginning with her starring role in 1952 with Gene Kelly in "Singin' in the Rain." Fisher, 60, won fame through books, movies and plays. She is best known for playing Princess Leia in four of the "Star Wars" movies. Susan Gennaro is dean of the William F. Connell School of Nursing at Boston College. She said all people have felt or will feel the loss of a loved one that leaves them feeling like their heart is breaking. That can bring on stress, which can affect a person's health, Gennaro said. That is especially true for a person who already has health problems. Gennaro said she does not believe people know how to control their bodies "to the point that we can will ourselves to die." But, people can make the decision to "give up" on life, or to fight and hang on, she said. "I don't know why we are surprised as we also all have stories of people who were dying and waited until a loved one arrived before dying or some other important event," Gennaro said. For people who believe that death is followed by an afterlife, it can make sense to want to join a loved one who passed away, Gennaro added. "It makes all the sense in the world that Debbie Reynolds having lived a full life would prefer to ‘pass' to another existence with her daughter," Gennaro said. Harvard University's School of Public Health did a study in 2013 that examined health information for 26,000 Americans over age 50. It found an increased chance of dying after a spouse dies. People who lost a wife or a husband had a 66 percent increased chance of dying three months after the spouse's death, the Harvard researchers said. David Kessler is a grief expert who has written five books about losing a loved one. "There is a stress that comes with deep heart break and that stress can affect your heart," Kessler said. "For some people that passes. But, in some cases, people die from it." Kessler said his advice to people experiencing loss of a loved one is to accept the pain and sadness. "We often want to run away from the pain, but that grief will actually help us heal in time if we don't run away from it," Kessler said. Kessler is still dealing with his own grief. His 21-year-old son died unexpectedly on September 12. "I've worked many years with people going through grief," Kessler said. "This year, it's personal. I certainly feel a kinship with Debbie. Your heart is just so broken when you lose a child. I can see at 84 years old, she was just done." The shock and extreme heart break brought me to my knees. Forty-thousand children a day die from preventable diseases. A superstar of the musical circles passed away. Without the support of my parents I would have probably cracked up completely. But I managed to hang on. 1.We often want to run away from the pain, but that grief will actually help us heal in time if we don't run away from it," Kessler said. Smith has run away from home, but his family are putting a good face on it. 2.But, in some cases, people die from it."